Ready … Jet … Go! What do you get when you combine jet boat action in the Glenorchy region with an ancient forest guided hike and a scenic 4-wheel drive back-country tour? One awesome day out! And, if you are looking for all-out jet boat action and excitement, then there’s a second Dart River option worth considering. This is the trip that delivers an adventure package combo to suit all ages. The best way to start any day and get the blood pumping is seated in a jet boat, and this one offers a thrilling 90-minute journey through the Dart’s ever-changing braided river system. 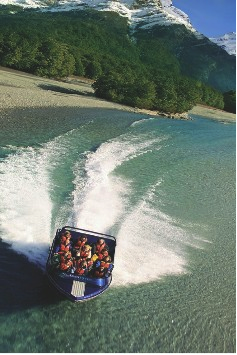 Your heart will be racing as the jet boat speeds over the shallow river, conducting the odd 360-degree spins, whilst your mind and eyes are at the same time feasting on your surroundings of breathtaking snow-capped mountains, ancient native forest, waterfalls and glacial valleys frozen in time. The trip includes an easy guided 30-40 minute walk through the ‘Heritage Trail’ at a place appropriately named Paradise. 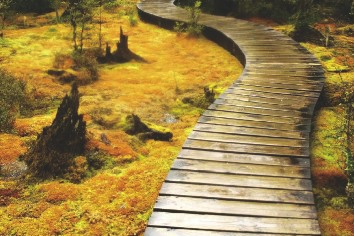 Here a knowledgeable guide will enliven your walk with an informative and entertaining commentary about the ancient native beech forest, the unique flora and fauna, as well as the fascinating Maori and colonial history of the area. You‘ll also journey by 4-wheel drive coach via a scenic back-road route, hearing stories about the surrounding countryside and enjoying breaks to view panoramic landscapes that have formed the epic backdrop to many international films, including ‘The Lord of the Rings’. For those adventurous souls who wish to experience the exhilaration of the longest Jet Boat ride available in the Queenstown region, then this second Dart River option is definitely one you should try. This journey offers you three full hours of classic jet boat action as your expert driver negotiates the shifting shallow channels of the magnificent glacier-fed Dart River. Naturally, he’ll add to the excitement with spine-tingling jet spins. From the comfort of these fully-equipped jet boats, you’ll soon discover the spectacular beauty that makes up the unforgettable Dart River region. You’ll also be given a choice of a short walk to hidden rock pools deep in Mount Aspiring National Park. 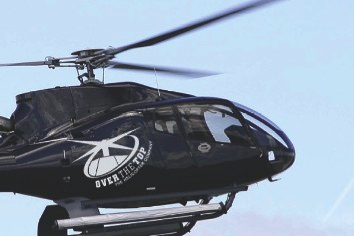 Dart River jet safaris are a unique combination of pulse-racing action and heart-stopping beauty. In the Adventure Capital of New Zealand, it’s a mix that’s hard to beat.